Where does lithium come from? Where is lithium found in North Carolina? There are lithium deposits around the world, but only a few of them are economical to explore and develop. In North Carolina, lithium is recovered from a mineral called spodumene which appears naturally in pegmatite rock in parts of Gaston, Lincoln, and Cleveland Counties in the Piedmont areas west of Charlotte. We estimate the concentration of lithium in the rock on our site in Gaston County is greater than 1.1% lithium oxide (Li2O), which is considered a high concentration with considerable economic value. What kind of mining operation will Piedmont have in North Carolina? How will you extract lithium from the earth? We will use open-pit mining to extract the spodumene on our site. We will mine the pegmatites and then deliver them to a concentrator plant we will build on our site. There we will crush the rock to a fine size. The spodumene is then separated from other minerals in the rock using methods common in mineral processing, including flotation. The concentrated spodumene from our plant will have a lithium content that is six times greater than the mined ore (6% Li2O). This concentrate can then be converted into lithium chemicals that are used in batteries. Why do you want to build a mine in this area? Didn’t companies mine lithium in North Carolina in the past? How valuable is the lithium in the region? The North Carolina deposit, running about 30 miles west of Charlotte and usually referred to as the tin-spodumene belt, has long been recognized as one of the world’s most abundant sources of lithium, and it is the only one of its kind in the United States. In fact, North Carolina supplied most of the world’s lithium from the 1950s through the 1980s, from mines that were similar to our project design. However, in the 1990s the major lithium producers turned their attention to previously unexplored deposits in South America and Australia and let the North Carolina mines go dormant. Then the business changed at a rapid pace. Demand for lithium has grown dramatically as a result of the deployment of lithium-ion batteries in everything from mobile phones to power tools and now electric vehicles. With the dramatic growth in demand, it once again makes economic sense to develop the North Carolina deposit. The deposit is especially valuable today, given that the Piedmont region, as opposed to remote areas of the world, has a well-invested infrastructure, access to shipping ports and a good workforce. Where is the mine going to be located? Our operation will be located along Hephzibah Church Road to the east and west of Beaverdam Creek including the intersection of Hephzibah Church Road and Whitesides Road. 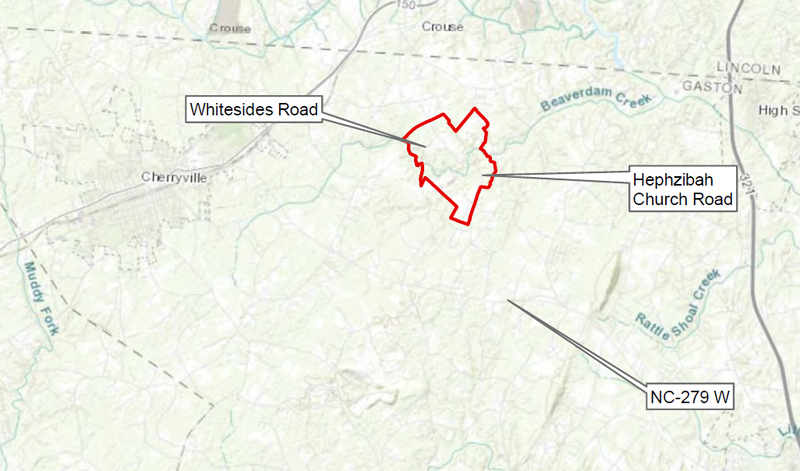 Our permit application currently covers the area shown below. How deep with the open pit mine be? The pit could be as deep as 500 feet. Below that there is little commercially valuable ore.
How much land is involved? We have assembled 1,800 non-contiguous acres across Gaston County. The area we are permitting is just under 1,000 acres. Will there be underground mining? We have no plans to mine underground. Our operation will be a surface mine. Yes, part of our mining operation will require blasting. We are working closely with Deep Earth Logic from Charlotte, North Carolina, to undertake pre-blast surveys in the area surrounding our project. This is to minimize the impact on the surrounding area. We are required by the state to monitor vibrations associated with our mining activities. We will locate one or more seismographs at the nearest buildings from our pit in order to measure the impact we have. The limits on vibration and air pressure put in place by the state of North Carolina for mining operations are twice as restrictive as those for general construction. Will the blasting process damage houses or buildings surrounding the mining site? Vibrations from blasting on site might be felt some distance away from our operation, but we do not expect these vibrations to be strong enough to damage property. How often will blasting occur at the site? Blasting may occur as often as once a day, most likely during the shift change when no one is in the pit. What is left over from the mining process? What happens to the waste rock? The non-lithium bearing rock that we remove from our excavation, called overburden, will be stored on site. Initially we will pile overburden on the surface within our permit boundary. Eventually, we expect that we will replace some of this overburden back into our excavation as we exhaust the deposit of lithium. The residue from our processing plant, called tailings, is essentially the minerals that have no economic value. We will dry these tailings in our processing plant, mix them with the overburden material, and store them on site. Will there be hazardous materials left over from the mining process? No. The only residue of lithium mining is the tailings, which are naturally occurring and harmless. We have completed a number of lab studies demonstrating the non-hazardous nature of our overburden and tailings. Is your process anything like fracking? No. It is nothing like that. Fracking—more accurately called hydraulic fracturing—involves using water and chemicals to fracture mineral deposits underground. Our process is hard-rock surface mining. Will you have anything like an impoundment, tailings pond or lagoon, or tailings dam? Are you putting any chemicals in the waste pile or the water? What about water usage? What will happen to my well? We will use water as part of the flotation process to separate minerals with economic value. Because we dry our tailings, our water demand in our processing plant is low. We will not have an impoundment, dam, or lagoon. The water that is discharged from our site will be surface runoff from rain and the excess water that we will pump from our excavation. We do not expect to have a negative impact on the quality of water in the area. As we pump water from our excavation this may or may not result in a lowering of the water table in the immediate area surrounding our operation. We are currently modeling the effect our operation will have on surrounding groundwater levels. We will undertake an inventory of wells in the area surrounding our project and will closely monitor ground and surface water levels and quality during operations. Are you closing roads in the area? Where? We propose to close roads which are entirely within our permit boundary, and we are working on studies to model the potential travel time impacts associated with these closures. We are coordinating these activities with Gaston County and NCDOT. Coordination has also been initiated with various emergency services and Gaston County Schools. How much truck traffic will there be leaving your site? We expect to produce about 170,000 metric tonnes of spodumene concentrate each year. To ship this material off site will require around two trucks per hour running during day shift only. We have not finalized a transportation plan at this time. Aren’t you building a chemical plant as well as a mine? Our project has two phases: a mining phase, which will produce spodumene concentrate, and a chemical production phase, which will eventually produce battery-grade lithium hydroxide, a critical compound for battery producers. The mining phase will utilize a concentrator plant located onsite that will create the spodumene concentrate. The chemical phase will occur in a chemical conversion plant to convert the spodumene concentrate into battery-grade lithium hydroxide. The location of the chemical plant is currently undetermined. We expect to have our permits completed by the end of 2019 as well as the necessary studies to begin the excavations and construction for the first phase of the project. How much are you investing? How many jobs will there be? Assuming all goes according to plan, we will make capital investments of approximately $130 million to open the mine and build the concentrate plant. We expect at that point we would employ 150 people, working in two shifts. What about the chemical plant you have talked about? What is the timetable and investment? Once the mine is up and running, we will seek investors to help us build a lithium hydroxide plant. This will require an additional investment of $340 million and will employ another 150 people. We are several years away from construction on this aspect of our business. Where will the chemical plant be located? We haven’t settled on the site, but the chemical plant needs to be located near a rail line, so it will likely be in the region but not at the mine site. What if I am interested to sell my land or my house? Who can I contact? You can contact our office in Belmont, North Carolina. Please e-mail us ahead of time at community@piedmontlithium.com so we can schedule an appointment for you. Our operation will be very competitive, so we expect to first be a domestic source of lithium for the lithium battery industry, including producers in North Carolina, but we also expect to serve the global lithium battery industry, including the major producers in Asia. Are you going to be having any meetings for area residents or the community? When will those be? We will hold several information meetings to present our full project to the community and area residents. We expect those meetings will be mid to late summer 2019 once we have completed our next phase of study and our permit applications. We will post our meeting times and locations here on our website and in local papers. We continually update news on our website. But if you have questions, contact us at community@piedmontlithium.com. You can also follow us on LinkedIn at Piedmont Lithium Limited or on Twitter @PiedmontLithium.